Book N Gauge, the monthly Book Culture event, will feature Nze Sylva Ifedigbo author of the recently published collection of short stories, “The Funeral Did Not End" and Atilola Moronfolu, author of Anatomy of Mirage. The event, in its sixteenth edition, will draw from the theme: “Unending conversations”. The event will explore how literature is fuelling never-ending conversations about issues that are dear to our hearts. In the boundless spirit of unending conversation, the 1t6th edition will also feature Nigeria’s premier spoken word Poet, Sage Hasson and Violin aficionado, Ernest Bisong. Book N Gauge is organised by the Pulpfaction Book Club, a group of literary-minded individuals driven by a passion to make reading hip again. 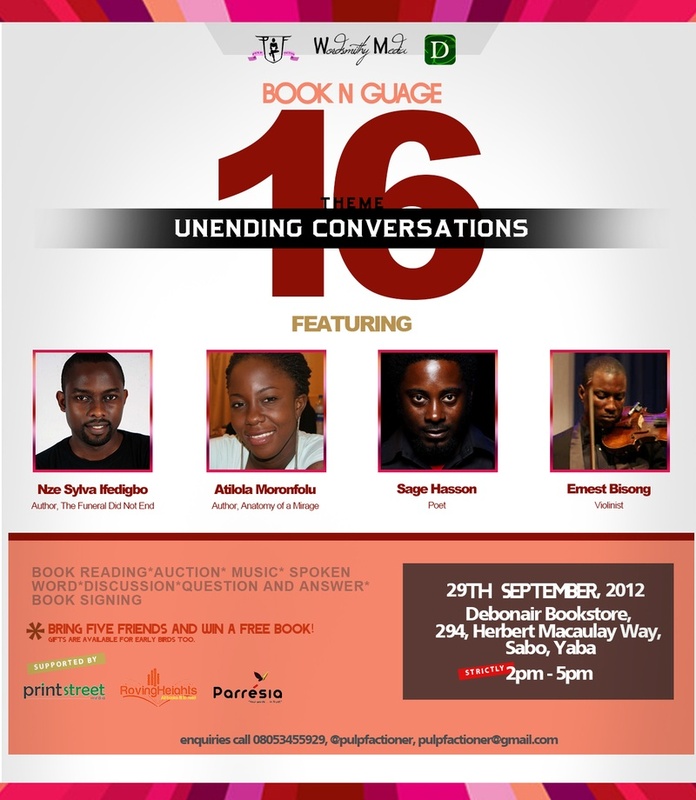 The event is scheduled for the Saturday, 29th September 2012 at the Debonair Bookstore, Sabo, Yaba, Lagos.